Peter Jenkins, Britain’s former representative on the International Atomic Energy Agency, has told the debating union at Warwick University that a ‘just war’ is not a Jewish notion. Jenkins was obviously telling the truth but the Zionist Jewish Chronicle is not happy. The JC reported this week that the remark prompted the Zionist Federation opposition speaker Jonathan Sacerdoti to call out “shame”. Sacerdoti spoke to the audience in a capacity of "a son of a Holocaust survivor", he said “I suggest that the speech that we heard first, laced with its subtle attempts at antisemitism, masked behind polite diplomatic chatter is exactly the problem in this debate… this is not a Jewish issue, this is not an Israel issue, this is a worldwide issue.” I actually agree with Sacerdoti -Zionist madness is the biggest threat to world peace. it is not just a Jewish issue, it is not an Israel issue, it is a worldwide issue, it is a universal concern. Yet, I am slightly perplexed, why is telling the truth about Jewish culture anti-Semitic? is not the Old Testament far more violent than any Quentin Tarantino film? Needless to mention the Jewish State has, also managed to buy itself quite a reputation by now. Mr Sacerdoti added: “It is incredible to think that a man, unashamed to express such a view in public, once had such a senior position on behalf of the UK.” I would obviously argue that it is our intellectual duty to call a spade a spade and to criticise Jewish politics and Jewish culture for what they are. If Jews insist to operate politically they must accept that their politics and practice will be subjected to scrutiny and criticism. Mr Sacerdoti is obviously a Hasbara spin master. He mentions that “this particular view, that Jews do not adhere to the concept of ‘just war’ implies that Jews are by nature bloodthirsty and unjust. I believe any such generalisation about the nature of Jews is racist.” But here is a slight problem, Mr Jenkins didn’t speak about Jews, the people, the ethnicity or the race , he was clearly referring to “Israel” i.e. 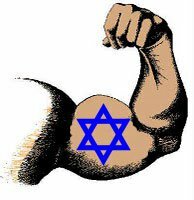 The Jewish State and to Jewish culture. The Community Security Trust, another Zionist militia operating in our midst moved to condemn Mr Jenkins’ remarks; “it is disgusting that students should be exposed to such divisive rubbish. Peter Jenkins appears to be as ignorant of the history of Christian war-making as he is of Jewish values.” It would be helpful if the Community Security Trust’s spokesman would be kind enough to offer some information that could present the Nakba, Sabra & Shatila and operation Cast Lead in the context of ‘just war’. It would be also helpful if the Community Security Trust’s Rabbis can enlighten us as to how Biblical Samson's genocidal action fits into the notion of a ‘just war’. The truth better be said. Mr Jenkins told the truth and actually used a moderate and careful language. I wish the BBC and the Guardian were as courageous as Mr Jenkins. I also do no think Zionist organisations should be the one who moderate the critical discourse of the Jewish State and Jewish culture.